An exercise ball is made up of soft elastic having a diameter of 35 to 85 centimeters filled with air. It is somewhat like a big bouncy ball used for a physical therapy and it can be called in many ways such as Swiss balls, Birth ball, Body ball, Fitness ball, and Therapy ball, etc. Gym balls come in different sizes according to the body size of the user. Exercising with this ball makes the body to remain balanced in the air pressure which makes us to do exercise comfortably. The exercise ball is used with yoga or exercise program. It’s also used for the physical therapy and it requires doctor’s suggestion before setting to workout. A simple workout with this will help you improve the muscle tone and body balance. During the Fitness Workouts it is really comfortable as they are light in weight and heavily durable. It is also available with many colors that attract the users. 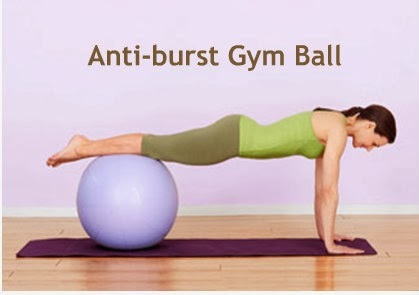 Training that is acquired with this anti-burst gym ball in the right manner will improve your posture and shape. Doing exercise regularly with this accessory will improve the core alignment, flexibility and coordination. Using it properly will help in strengthening your overall muscles and especially the lower back muscles so that we can keep our stabilization in proper condition. Mainly it is used to balance any weight – bearing muscles. Some people are very much interested in doing exercise with the exercise ball as it will make them more fit and healthy! Try to buy a quality ball that is very much standardized for perfect exercises.